Educators interested in 3D printing will have a venue this fall to learn more about how to use it in K-12 and higher education. The second annual Construct3D conference and exposition will be taking place at Georgia Tech in Atlanta Oct. 5-8. 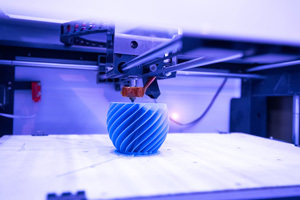 The emphasis will be on professional development to help faculty, staff and students learn new skills and promote the adoption and use of 3D printing in the classroom. Last year's event held more than 100 talks and workshops, as well as a vendor area where companies could demonstrate their design and digital fabrication products and services. Keynotes were delivered by representatives from MIT's Self-Assembly Lab, Duke University's Osher Lifelong Learning Institute and Maker Media, which hosts maker faires around the world. The event was co-founded by three people: Duke Digital Media Engineer Chip Bobbert has developed one of the largest 3D printing-focused makerspaces in higher ed. Ultimaker education community strategist Lizabeth Arum has long worked with 3D printer companies and researchers to explore the needs of teachers who want to use the technology in their classrooms. Matt Griffin, director of community for Ultimaker, recently finished a massive, open, online course for Coursera on 3D printing hardware. While staff from Ultimaker co-founded the event, the Construct3D team has committed to making the event company-agnostic, promising to speak to "all of the approaches to desktop 3D printing and digital fabrication equipment, software and materials in use by educators." "As digital fabrication continues to develop as an integral aspect to all levels of education, we are thrilled to host the upcoming Construct3D conference," said Amit Jariwala, director of Design & Innovation for the School of Mechanical Engineering at Georgia Tech. "Our goal is to leave attendees feeling inspired to bring new 3D printing skills to their schools and programs, and ultimately shape the next generation of creators and innovators." Registration, including a scholarship application process, will open in April on the Construct3D website.